On November 4, 1979, the Euskal Herrian Euskaraz (Basque in the Basque Country, EHE) association was launched in Durango, Bizkaia under the slogan “Euskararik gabe, Euskal Herririk ez” (Without Basque there is no Basque Country). It is an association that defends the right to live in Basque in the Basque Country. Today, its principal goal is to achieve a Basque-speaking Basque Country made up of polyglot or multilingual people. Today, the association focuses its concerns on certain areas: the right to learn and study in Basque throughout the educational systems of the whole Basque Country, the right to use Basque and be dealt with in the language in all official situations (including, for example, healthcare, legal contexts, and any circumstances involving the public administration), the right to receive information via the media in Basque, the more general demand for linguistic normalization (comprising much of the aforementioned goals), and challenging what it interprets as any assaults on the linguistic rights of Basque speakers. EHE symbol on a Basque-Spanish bilingual board, deleting text in Spanish (Zaldibia, Gipuzkoa). Photo by Josu Goñi Etxabe. Courtesy of Wikimedia Commons. From the outset, and to this day, the EHE association emphasized its activist nature. That is to say, it is an association that is nonaligned to any political party but advocates peaceful social protest to raise awareness about the minoritized status of Basque as well as in pursuit of basic goal of demanding a Basque-speaking Basque Country. This is considered controversial in some quarters, especially as the association challenges many official administrative goals of bilingualism in the Basque Country, asserting that such goals–in the context of a minoritized language–actually result in a situation of diglossia, in which an “H” or “high” language continues to occupy a dominant position over an “L” or “low” language. Language is a key theme for many of the Center’s publications. See, for example, Language Rights and Cultural Diversity, edited by Xabier Irujo and Viola Miglio (free to download here) and The Challenges of a Bilingual Society in the Basque Country, edited by Pello Salaburu and Xabier Alberdi. Sign promoting the learning of Welsh. Photo by Alan Fryer, courtesy of Wikimedia Commons. The August 6 edition of Basque-language daily Berria included an interview with Alun Davies, the Welsh Government Minister for Lifelong Learning and Welsh Language. In the interview, Davies speaks about Cymraeg 2050 – the Welsh government’s ambitious plan to double the amount of Welsh speakers, to one million, by 2050. In the interview, Davies explains that the first stage of the plan is to extend knowledge of the Welsh language, to be followed later by focusing on encouraging people to use it, all as part of a 3-point plan. With 22% of the Welsh population (of approximately 3 million people) enrolled in Welsh-language medium schools at present, the plan seeks first to increase this figure to 30% by 2030 and 40% by 2050. It will then attempt to put mechanisms in place whereby students continue to use Welsh on leaving the school system (with the objective that 70% of all students leaving the school system will be able to speak Welsh), but with the main aim of creating new Welsh speakers. Finally, the plan envisages creating a wider context in which knowledge and use of Welsh are encouraged, especially in the workplace. For Davies, the Basque experience has been a frame of reference and the Welsh Government can learn much from its Basque counterpart. See the full Berria article (in Basque) here. And check out the Welsh Government’s own outlining of the plan here. Check out Estibaliz Amorrortu’s Basque Sociolinguistics: Language, Society, and Culture, available free to download here. See, too, The Challenge of a Bilingual Society in the Basque Country, edited by Pello Salaburu and Xabier Alberdi. Street sign in Basque in Iparralde. Image by Lucyin, courtesy of Wikimedia Commons. In a press conference organized today, July 5, in Baiona (Lapurdi) by the Basque government, the Navarrese Institute of Basque (part of the Navarrese government), and the Public Office for Basque in Iparralde, the findings of the Sixth Sociolinguistic Survey (2016) were announced. These are surveys carried out every five years to gauge the health of Basque and serve as a basis for pro-Basque initiatives in education as well in wider society as a whole. Sign in Basque and Spanish signaling the Trail to Santiago, Barakaldo, Bizkaia. Image by Tuc Negre, courtesy of Wikimedia Commons. Taking into account the whole Basque Country in Spain and France, 28.4% of the population aged 16 or over can speak Basque, and a further 16.4% are passive Basque speakers (in other words, people able to understand Basque, without being able to fully communicate in the language). Compared to the findings of the first survey, which was organized twenty-five years ago, approximately 223,000 more people speak Basque today. The largest percentage of Basque speakers is to be found among young people aged 16-24 (55.4% of whom speak the language), whereas the lowest percentage of Basque speakers is now to be found among those aged 65 or older (20.4%). According to the findings of the 1991 survey, 22.3% of the population spoke Basque, so these latest data demonstrate an approximately 6% growth rate in the last 25 years. The driving force behind this change is clearly that of young people, who now occupy the largest percentage of Basque speakers; in contrast to 25 years ago when older people enjoyed a greater prominence among the total percentage of Basque speakers. As regards Basque-language use (in contrast to mere knowledge of the language), 25.7% of the total population speak Basque in one way or another (10.3% more typically than Spanish or French; 6.2% about equally as those two languages; and 9.2% in less of a way than the two other languages). Moreover, a further 5.2% of the total population speak Basque “a little,” that is, in a residual way. In terms of transmission, where both parents are Basque speakers, in 93% of cases they only speak to their children in Basque, and in 7% of cases, in Basque and Spanish or French. When just one parent is a Basque speaker, in 83% of cases parents speak to their children in Basque and Spanish or French; and in 17% of cases just in Spanish or French. And when it comes to attitudes toward Basque, 55.8% of all people aged 16 or over is in favor of pro-Basque language initiatives; 28.2% is neither for or against such initiatives; and 16% is against any such initiatives. Moreover, 85.5% of people aged 16 or over believe that in the future everyone should speak Basque and either Spanish or French in the Basque Country, while 9.2% think that just Basque should be spoken, and 4.1% would prefer that just Spanish or French was spoken. Finally, with regard to primary and secdondary education, 57.6% of the population favor complete immersion in the Basque language for their children (Basque as the vehicular language with Spanish or French as subjects), while 23.7% favor a bilingual model (equal teaching hours devoted to Basque and Spanish or French). Check out Basque Sociolinguistics: Language, Society, and Culture, by Estibaliz Amorrortu, free to download here. Last Saturday, December 3, was the International Day of the Basque Language, and it was celebrated around the world through a variety of different events. Here in the United States, the UC Santa Barbara’s Basque Studies department held a day-long event with traditional dances, a book presentation, and food. They also inaugurated their Basque Club, zorionak! Meanwhile in Boise, the Ikastola, or Basque-language school, and students at the Basque Museum put together a video inviting us all to speak in Basque: “Guk euskaraz, zuk zergatik ez?” or we speak in Basque, why don’t you? The music is by Jose Antonio Larrañaga Etxabe, better known as Urko, but the song is based on a text by Gabriel Aresti. Fun fact: The Day of the Basque Language is celebrated on the 3rd of December to coincide with the feast day of Saint Francis Xavier, the Navarrese Jesuit, who is said to have spoken his last words in Basque, his mother-tongue. For more on Basque in general, check out some of the Center’s publications, like This Strange and Powerful Language by Iban Zaldua, an engaging essay that traces the development of Basque-language literature while contemplating along the way the reasons why bilingual people choose to write in smaller languages. See, too, Writing Words, Pello Salaburu’s compelling account of how a standard form of Basque was established, amid much heated debate, and how this served as a springboard for the revival of the language, through education, the media, and various cultural initiatives, all within a remarkably short space of time. Other works that may be of interest include The Dialects of Basque by Koldo Zuazo; Basque Sociolinguistics by Estibaliz Amorrortu (free to download here); The Challenge of a Bilingual Society in the Basque Country, edited by Pello Salaburu and Xabier Alberdi; and Basque Literary History, edited by Mari Jose Olaziregi. The Sanctuary of Arantzazu, in Oñati, Gipuzkoa. Image by Keta, courtesy of Wikimedia Commons. In the Fall of 1968 one of the most important ever meetings was held regarding the fate of the Basque language. Organized by Euskaltzaindia, the Royal Academy of the Basque Language, the Arantzazu Congress in Oñati, Gipuzkoa, was designed as a forum in which to debate and discuss the possibility of creating a unified or standard version of the Basque language from among its rich and diverse dialects. 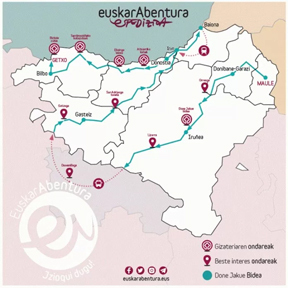 The leading Basque-language experts of the day gathered that October to work out a suitable model on which a potential Euskara Batua (Unified Basque) could be based. The meetings within the congress were often heated and arriving at agreement was by no means a smooth process. There was clear resistance on the part of many influential thinkers to creating such a unified model. Yet many others, including the leading theoretician of the day, Koldo Mitxelena, believed that Basques needed a standard version of their language–something that, at the end of the day, the “big” cultures had already implemented in previous centuries–for Basque culture itself to survive. In addition to the specific subject of the congress itself, one should also remember the wider context in which it was held: 1968 was the year of major civil unrest in Paris and this had a significant effect on the rest of Europe; there was widespread protest against the Vietnam War; and, more generally, social turmoil, protest, and change were sweeping across the old continent, with the Basque Country also experiencing the beginnings of a major social, cultural, and political upheaval in what would ultimately prove to be the final years of the Franco dictatorship. The dramatic and often highly charged story of how standard Basque was designed and later successfully implemented in wider society through education, the media, and literature, all remarkabaly within the space of a generation, is recounted by Pello Salaburu in Writing Words: The The Unique Case of the Standardization of Basque. The Dialects of Basque by Koldo Zuazo charts the diversity of the Basque language in its dialects but, as the author contends, mutual comprehension among native speakers is not as difficult as has been previously contended. Basque Sociolinguistics by Estibaliz Amorrortu examines various dimensions of the Basque language and its role in Basque society as a whole, including a chapter on the use of Basque in the United States. Download a copy free here. The Challenge of a Bilingual Society in the Basque Country, edited by Pello Salaburu and Xabier Alberdi, is a multiauthored work that explores a wide range of topics associated with the challenges implied by encouraging a bilingual society: from how to implement this idea in legal terms to language-use in education and the media. Any reflection on the Basque language must include some consideration of the work of Koldo Mitxelena: Koldo Mitxelena: Selected Writings of a Basque Scholar, compiled and with an introduction by Pello Salaburu, is a marvelous English-language introduction to the prodigious contribution of Mitxelena to the study of Basque.